The new version of the old-school news site shows the virtues of slowing down and savoring the Web. 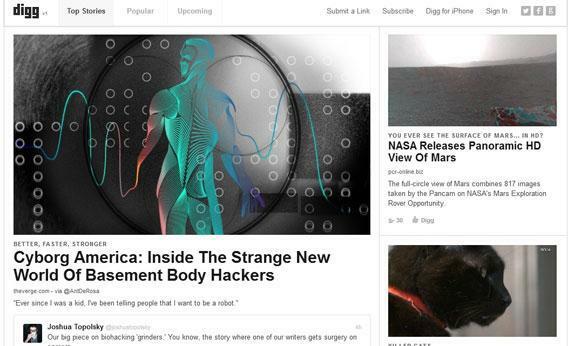 The new Digg looks nothing like the old Digg. For one thing, it lacks people. In the old days, the pioneering site attracted a raucous crowd of loyalists who would post and comment on every passing outrage in tech and politics. Reading Digg, which I did just nearly every day from about 2005 to 2009, was like taking the pulse of the Internet’s geekiest vanguard. Sure, everyone there was of a certain type—people who worshipped Comic-Con, loved Linux (and sometimes Apple), hated Microsoft, and considered news bloopers to be the zenith of comedy—but they were anything but boring. If you were a news junkie, like I am, Digg was the place to be: fast, brimming with the newest interesting stuff, and constantly changing. You’d refresh it at least a half-dozen times a day, and most of the time, you’d find amazing links that you hadn’t seen anywhere else. The new Digg is placid by comparison, and purposefully so. Much of today’s Web is sliced up into “feeds”—infinitely scrolling streams of links that zoom by you on Twitter, Facebook, Tumblr, Flipboard, Reddit, BuzzFeed, and on and on. You could make a good case that the old Digg inspired much of today’s craze for streams. But the new Digg takes a different tack. It eschews the stream. Rather than a rushing river, the site’s new operating metaphor is a photograph. A few times a day, Digg captures a snapshot of all of the Web’s hottest streams. Then it presents a smart, gorgeous, editorially coherent digest of what’s popular online. Other sites have attempted this, but the new Digg is the first place that does it well. If you’ve always fretted about keeping up with the Web’s streams—if you have neither the time nor much interest in following every meme generated by your social-media-saturated compatriots, the new Digg is for you. It lets you stay in touch with digital culture without being overwhelmed by it. It’s a haven for news turtles stuck in a Web otherwise ruled by hares. Digg’s rebirth is a surprising turn. From about 2010 on, the old Digg began to nosedive. As a result of a series of design and policy changes that roiled Digg’s fan base—and because it was getting beaten by faster news-distribution channels like Facebook and Twitter—its traffic and revenue tanked. 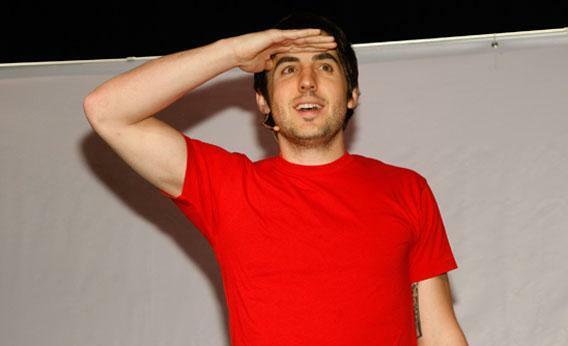 A couple weeks ago, I interviewed Kevin Rose, the site’s boy-wonder founder, onstage at a Silicon Valley conference called the Founder Showcase. I asked him if he’d been reading the old Digg at the end. A bit sheepishly, he admitted he hadn’t. But no one was surprised. For much of the last year, Digg was effectively dead. Last month, Rose and Digg’s investors sold off what was left of the beleaguered firm. Digg’s staff was hired by the Washington Post Co. (which also owns Slate). The firm’s patents were purchased by LinkedIn. And the name and website were sold to Betaworks, the New York tech incubator that created a number of successful social media sites, including Bitly, Chartbeat, and TweetDeck. The Post Company and LinkedIn paid millions for Digg’s team and patents, but it was the amount that Betaworks paid for Digg’s domain that won headlines: just $500,000. Rose said that other firms had offered significantly more for Digg’s name, but he didn’t trust them—many wanted to use the popular domain as a doorway for spam and other sleazy stuff. Betaworks, by contrast, had a plan for the site. For a couple years, the company had been building News.me, a personalized news aggregator for mobile devices. Its other products—Bitly and Chartbeat in particular—also suggested that the firm knew how the online news business worked. Betaworks wanted to channel all of its expertise into rebuilding Digg into a modern version of what it had once been—a place that gathered the most popular stuff online. There is no deficit of news digests on the Web. In addition to News.me, there’s Flipboard, Zite, Wavii, and Summify (which Twitter purchased earlier this year). Some of these services are terrific, but they all aim for something that the new Digg, to its credit, doesn’t: They all want to “personalize” the news, to corral your various interests into a front page designed just for you. But the new Digg isn’t just a slave to the crowd. While it takes empirical measurements of popularity into account, the page is also the product of careful curation by a team of editors and designers. Much like a newspaper’s front page, Digg’s design conveys a sense of the importance of each story, a powerful signal for people who aren’t following this stuff obsessively. I love Reddit, but it’s best for people who have time to follow it closely and familiarize themselves with its in-jokes. Reddit’s motto—“The front page of the Internet”—more properly belongs to the far more accessible Digg. And that gets to the other great thing about Digg: It’s just a front page. At any given time, there are only a few dozen stories featured on the site, and you can get through the whole thing in three or four scrolls. It has a better signal-to-noise ratio than just about any other site online. And, in another effort at reducing noise, Digg doesn’t feature comments. The site will show you one or two related tweets under some stories, but for the most part, it is unburdened by the cacophony that drowns out the rest of the Web. There is a downside to Digg’s snapshot model of news. If you are constantly in search of new stuff online, you might tire of Digg’s lethargy. When I checked it this morning, most of the stories I saw—from the Verge’s piece on “body hackers” to a designer’s new take on Wikipedia to the news that Starbucks will begin accepting payments through Square—were things I’d already seen on Twitter, Facebook, email, or other aggregators. Compared with just about everything else online—even compared with the old Digg—the new Digg is slow. But so what? For some people—maybe even most people—news on the Web moves too fast. Digg proves slow isn’t bad. It might even be better.